Wonder which direction the market will go? Take a look at our new “Candle Meter” indicator below. The first thing you’ll notice is the box on the top right corner: It shows you the strength of the current candle, in real time. And just below that is the time left until the current candle closes. But how do you interpret this Candle Strength value? It’s very simple. The more bullish (or bearish) the current candle is, the more likely it is that the next candle will also be bullish (or bearish). For example, in the photo above, the current candle is 83% bearish. So we know the bears are domninating. And the next candle will likely be bearish. The histogram helps you visual the change of the candle strength over time. And the 2 Moving Averages helps you identify trends right from the beginning. And this special kind of moving averages based on candle strength reacts to market changes VERY FAST. So, how do I trade with the Candle Meter indicator? My favorite part about the Candle Meter indicator is that it’s NON-LAGGING. Meaning it tells me when a new trend has begun well before the regular indicator does. In this example, the 2 Moving Averages of the Candle Meter indicator crossed and gave you a hint that a new uptrend has begun. This signal came very early… much earlier than what the regular, old-school indicators would have given you. A Moving Average cross gave a signal that a big market move was about to happen. And if you followed this signal, you would have gotten a nice, easy winning trade. In this example, the market is currently in a downtrend. Then the price starts to move up in a retracement (the area in the yellow rectangle). During this pullback, you see a series of bullish candles. 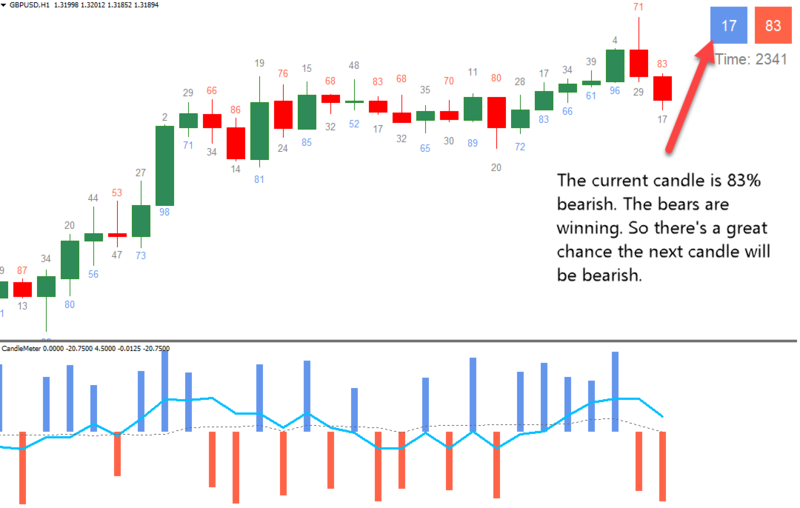 But look at the Candle Meter historgram, notice how the strength of these bullish candles decreases over time. It tells us that the bulls are gradually losing their power. Then finally, we got a big bearish candle. The strength value of this candle is 80% bearish. And this number tells us that this pullback has ended and the price will soon resume its original direction. And if you decided to take this trade and entered at the close of this candle, you would have gotten an easy winner. If you would like to pay through Skrill, log in or create a Skrill account and send $37 to [email protected] with message “For Forex Candle Meter Indicator” and you will receive indicator download information within 24 hours. If you would like to pay through Neteller, log in or create a Neteller account and send $37 to [email protected] with message “For Forex Candle Meter Indicator” and you will receive indicator download information within 24 hours. If you would like to pay through Perfect Money, log in or create a Perfect Money account and send $37 to U14173568 with message “For Forex Candle Meter Indicator” and you will receive indicator download information within 24 hours.